Multi-platinum mixing and mastering engineer Luca Pretolesi takes you step by step through his entire mixing and mastering process for Major Lazer’s hit single "Light It Up (Remix)". Luca is Major Lazer’s "Finisher" and helps Diplo and his team combine multiple sessions into one sonic masterpiece. Learn Luca’s hybrid workflow and see how he takes a great static mix, applies stereo bus processing and then digs into the details it takes to create a hit-sounding EDM record. Hear countless before and after comparisons to learn the sound and attitude that’s required to create a killer mix. When it comes to mixing EDM there are no rules and now is your chance to see how Grammy nominated mixing/mastering engineer Luca Pretolesi breaks the rules and delivers a slamming sounding mix! BONUS: The artist and their label was gracious enough to allow pureMixers the chance to try their hand at mixing a portion of the the song using the same raw multitrack stems Luca mixed. 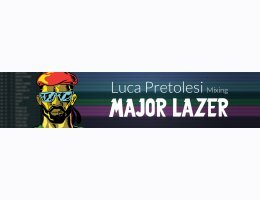 Luca (Credits: Major Lazer, Steve Aoki, Borgeous, Dimitry Vegas and Like Mike, Snoop Lion, Diplo) stands out among a sea of electronic engineers with his unique hybrid set-up, mixing old and new technology for an end result like no other. In place of a traditional mixing studio, he has created a mix of equipment including computer plugins, and custom made hardware, EQ’s and compressors, and high-end mastering gear. This combination of analog and digital parts allows him to add his touch to any project of any style as he has the best of both technological worlds at his fingertips.